CONTRIBUTORS Editorial and creative direction Glen Cheyne Design Andy Gerrard @round_studio Sub editors Jay Armstrong @jayarmstrong_ Elaine Taylor Photography Katharine Davies @Katharine_KDP Feature writer Jo Denbury @jo_denbury Editorial assistant Paul Newman @paulnewmanart Print Pureprint Distribution Available throughout Bridport and surrounding villages. 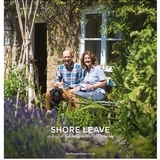 Please see bridporttimes.co.uk for stockists. 2 Bretts Yard Abbey Corner Sherborne Dorset DT9 3NL 01935 315556 @bridporttimes glen@homegrown-media.co.uk paul@homegrown-media.co.uk bridporttimes.co.uk Bridport Times is printed on an FSCÂŽ and EU Ecolabel certified paper. It goes without saying that once thoroughly well read, this magazine is easily recycled and we actively encourage you to do so. Whilst every care has been taken to ensure that the data in this publication is accurate, neither Bridport Times nor its editorial contributors can accept, and hereby disclaim, any liability to any party to loss or damage caused by errors or omissions resulting from negligence, accident or any other cause. Bridport Times does not officially endorse any advertising material included within this publication. All rights reserved. 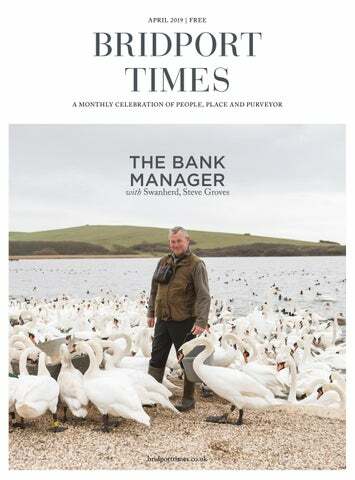 No part of this publication may be reproduced, stored in any retrieval system, or transmitted in any form - electronic, mechanical, photocopying, recording or otherwise - without prior permission from Bridport Times. Town Mill Arts, Lyme Regis DT7 3PU. £15 per session, first session half price. Bridport ASD & Social Anxiety Support Group Bridport Children's Centre. experience required, give it a go! Quaker Meeting House, South St.
St Swithun’s Church Hall, Allington. LSi Bridport, 51 East St. Essence Lingerie, 3 Barrack Street. group members or The Ropemakers. The Chapel in the Garden, Bridport. United Church Hall, East St.
Sladers Yard, West Bay, DT6 4GD. Beachhut Appliqué Workshop Boarsbarrow Gifts & Crafts, Loders frame & refreshments provided. £45. £12.50, £30 with dinner from 5.30pm. Ivy House Restaurant, Groves Nurseries. Bridport DT6 6RQ. £10 on the door. music on clarinet & piano. £9 at door. word theatre. £5 from Bridport TIC. The Garment Maker’s House 15 Pound Street, Lyme Regis, DTZ 3HZ. collection & paintings by Nick Ivins. APRIL 2019 The Salt House, West Bay, DT6 4EL. Comedy - pay what you feel. Bradstock, DT6 4RF. £2.50 per hunt. Trust, Pilgrims Latch, Eype DT6 6AL. Bridport Music, 33a South St.
West Bay Discovery Centre, DT6 4EN. Ink & Page, 39a West Allington DT6 5BJ. St Swithun's Church, Bridport. Free. The Chapel in the Garden, DT6 3JX. Chideock Village Hall, DT6 6JW. Bridport United Church Hall, East St.
British Legion Hall, Victoria Grove. Ancient folk with modern classical ideas. Discover the Nature of West Bay: Stepping into Nature Walk around West Bay. All ages. Donations welcome, book in advance. from Bridport TIC (& rotary members). Bridport Town Hall, DT6 3LF. Trill Farm, Musbury EX13 8TU. acknowledge or include them all. Bradley (acoustic guitar, miniature harp), Pete Judge (trumpet, cornet, rotary-valve tenor horn, dulcitone, harmonium, chimes, glockenspiels, lyre-harp) and Alex Vann (mandolin, bouzouki, bowed psaltery, tenor banjo, zither, hammered dulcimer) inhabit an instrument-strewn stage. Beguilingly unusual combinations make for a striking auditory experience, with instruments such as an eerie bowed psaltery and a late-Victorian Scottish acoustic keyboard creating a soundworld unlike any other. ________________________________________________________________ Saturday 27th April, 8pm Three Cane Whale Cafe Sladers, Sladers Yard, West Bay, Bridport, DT6 4EL. when the storm on the heath reduces King Lear to, ‘a poor bare forked animal’. In The Mayor of Casterbridge and The Return of the Native, Nature, in the form of the heath, seems indifferent to human suffering. At the same time the wildness, storms and the relentless sun work as metaphors for the passions inside the characters’ heads and hearts. In taking his titles and subject matter from Hardy, Brian Graham is entering that same wild, internal territory. His colours are thoughtfully applied and subtly nuanced, suggesting mood in a way similar to that by which music evokes feelings. This is visceral mood which feels physical just as the paint itself is physical and textured. ’You have to face it,’ Brian says, talking specifically of melancholy, ‘because inside it there is always light.’ Light and colour, water, time and traces of what has been, all can be found and experienced in these paintings. Brian works in acrylic, layering paint, adding texture and working back into it to uncover areas from underneath. Peeling back the layers of time, feeling into his subjects, his colours drift like clouds. Nothing is absolute. There is a softness, an ambiguity. These carefully considered gradations of tone and colour are invitations to explore and make your own discoveries. Brian’s first show at Sladers Yard in 2014 was entitled Palaeoscapes and was part of a great body of work completed over many years, exploring all the sites where Palaeolithic remains had been found in this country. Including references to the physical places as they are now, the paintings explored themes of hearth and shelter, rocks and sediment, tools and traces of humanity. Last year Brian’s solo exhibition, Towards Music, at Salisbury Museum and later at Southampton University, considered the evolution of music and dance, with each painting linked to a particular piece of music and its composer. Now in his seventies, Brian Graham is bringing his gaze close to home, using the language in paint that he has created over a lifetime to explore his own beginnings, and those of us all. The Great Heath: recent paintings by Brian Graham with ceramics by Adela Powell and furniture by Petter Southall is at Sladers Yard Gallery from 16th March to 6th May 2019. Brian will be in conversation with Professor Simon Olding on Friday 26th April at 6.30pm. will move into another phase of our adventure. Although their studios remained intact, after the fire, artists Marion Taylor, John Boyd and Charlotte Miller were unable to return to their workspaces due to safety and concerns over access. After months of uncertainty and reflection, Marion is now working from home, with renewed enthusiasm and a subtle change in the direction of her work. Images of semi-abstract flowers and bruised blooms are now seen beside her usual muse - Colmer’s Hill - along with a new series of paintings with petals and perfume at their core, inspired by her original training as a textile designer. Charlotte Miller is inspired by the beautiful landscape and coastal paths of West Dorset, painting in oils and acrylic. She walks each day near her home beneath Eggardon Hill, drawing inspiration for her narrative and sketched images. In the winter months she notices how the landscape reveals raw and skeletal structures and she aims to represent these hidden areas in her paintings, layering the paint, scarring and removing areas to create shape, light and colour. A new gallery in Sherborne Organic farm & education Relax, be inspired, soak up nature, learn a new skill, expand your horizons. We offer courses in sustainable living and nature connection. Your local holiday cottage specialist is currently looking for properties in the area to add to their ever-growing portfolio in Dorset. If you are considering letting your holiday home, we offer free, honest, expert advice on how to get the most out of your holiday property and the potential income you could generate through marketing. is a great place to start, as that’s what the brimstone larvae eat. One of the biggest challenges for pollinators is finding habitat, so planting ivy and allowing it to climb around trees or structures will give them a safe area to hibernate. As with all pollinators, they need lots of nectar-rich plants – why not create a border in your garden? If you sign up to the Get Dorset Buzzing campaign on our website, DWT will send you some pollinator-friendly wildflower seeds so you can get started on welcoming pollinators into your garden. Facts: •	The males have a slightly brighter, yellow tone, whereas the females are a paler green tone. Both have a small orange-brown spot on each wing. •	The brimstone is named after an archaic word for sulphur. •	When picked up, the brimstone becomes stiff and hides its legs from view in order to increase its leaf-like appearance and decrease its chances of being recognised. •	Brimstone’s are most attracted to purple flowers. Sign up to our Get Dorset Buzzing campaign and join our buzzing community to help pollinators in your garden. Photos ÂŠ Cat Bolado, Ken Dolbear MBE, Katharine Davies. breeding programme? Early in 2017 I was contacted by a friend in Holland who had a small raptor park. He owned a female Steller’s aged 3 years who was rather ‘difficult’. The bird in question was captive-bred in the Czech Republic and had been housed in a secluded aviary with no real training, conditioning or acceptance of people nearby or within its presence. I agreed to take the bird on and drove to Holland, via Germany! We are part of a breeding programme for Africa’s largest eagle, the ‘Martial Eagle’, and a new male was to be collected as part of this, hence the Steller’s would be collected on the return journey from Germany. Coming through customs was really rather funny: ‘Have you got birds on board sir?’ ‘Yes, here’s the paperwork,’ I replied. Distance: 5 miles Time: Approx. 3 hours Park: West Street car park, Bridport Walk Features: A walk which uncovers lesser-known Bridport and West Bay, exploring the history of the area. It’s a fairly straightforward, flat route which traces the outline and origins of Saxon Bridport between the Rivers Asker and Brit as well as stopping at a few points of interest. The outward route to West Bay follows the Brit before returning via the old railway line. Refreshments: An abundance of fabulous cafés, pubs and restaurants cater for all tastes on this walk. very finely, so fine that one has to hold the pot up to the light to see it clearly. In the case of bowls and dishes wavy lines are used. The pottery was distributed throughout Britain, primarily from the mid-second century AD into the fourth century AD. Jesse Carter would not have known that he was carrying on a tradition established here many centuries before him. Dorset can also lay claim to another important ancient British ceramic, Deverel-Rimbury, named after two Bronze Age barrow sites dug here in the 19th century. New Homes in stunning locations across the South West... Youâ&#x20AC;&#x2122;ll be amazed at the number of exciting new Bovis Homes developments in the South West! We are building dream homes in a variety of locations ranging from quiet village settings such as Somerton in Somerset, to a bustling new town within easy reach of city life at Sherford, Plymouth. With homes ranging in size from 2 -6 bedrooms there is a Bovis Home to suit every lifestyle! Visit any of our stunning show homes to experience a real example of what you can expect if you purchase your own Bovis Home and find out how we can help get you moving. Where Whereare areyour yourdevelopments developmentslocated? located? We Wehave havedevelopments developmentslocated locatedacross acrossthe thewhole whole of of the the South South West, West, including includingCornwall, Cornwall,Devon, Devon,Somerset Somersetand andWest West Dorset! Dorset! I’venever neverbought boughtaaproperty propertybefore, before,can can you you help help me me with with I’ve theprocess? process? the We are lucky to have a great team of property experts who can We are lucky to have a great team of property experts who can answer any questions you may have about mortgages, legal answer any questions you may have about mortgages, legal fees, stamp duty and anything else! We even work with a free fees, stamp duty and anything else! We even work with a free independent financial advisory service who will be able to work out independent financial advisory service who will be able to work out what you can afford and help find the right mortgage for you! what you can afford and help find the right mortgage for you! Is it true I can exchange my current home for Is it true I can exchange my current home for a new one? a new one? Yes, it is! Our Home Exchange scheme takes the hassle out of selling Yes, it is! Our Home Exchange scheme takes the hassle out of selling your home, because we buy it from you! With no chains, no estate your home, because we buy it from you! With no chains, no estate agents fees and us as your guaranteed buyer, it’s the faster simpler agents fees and us as your guaranteed buyer, it’s the faster simpler way to move. way to move. I’m looking looking to to downsize downsize––can canyou youhelp helpme medo dothat? that? I’m Our Smooth Smooth Move Move Scheme Schemeisisperfect perfectififyou youhave havean anhome hometotosell. sell. Our help sell sell your your existing existinghome homeby byinstructing instructingan anestate estateagent agent We can help your property propertyfor foryou, you,and andwe’ll we’lldeal dealwith withthem themon on to market your behalf. We We will will even evenpay paythe theestate estateagent agentfees feesonce onceyou’ve you’ve your behalf. completed on on your your new newBovis Bovishome! home! completed you ensure ensure your yourdevelopments developmentsintegrate integrateinto into How do you communities? existing communities? We are proud proud to to support supportlocal localcommunities communitiesand andcontribute contributetowards towards the community community in in aa number numberof ofdifferent differentways. ways.Some Someofofthe theways ways we have helped helped include includefifinancial nancialcontributions contributionstowards towardslocal local sports facilities, facilities, public public transport transportand andeducation educationfacilities, facilities,improving improving infrastructure, infrastructure, providing providingpublic publicart artand andcreating creatingpublic publicopen openspace space and areas of of play. play. Can Can II add add aa personal personal touch touchto tomy myhome? home? We We offer offer aa fantastic fantastic range rangeof ofoptions, options,including includingyour yourchoice choiceofofkitchen kitchen and and tiling tiling fifinishes. nishes. We Wealso alsooffer offeryou youthe theopportunity opportunitytotoreally reallymake makeit it you you own own with with aa wide widerange rangeof ofupgrades upgradesavailable availablesuch suchasasaachoice choiceofof appliances, appliances, lighting lighting options, options,sliding slidingwardrobes wardrobesand andmuch muchmore! more! Do Do you you offer offer discounts discountsfor forworkers workersin incertain certainsectors? sectors? Yes, we do! We offer an exclusive ‘Key Worker’ Yes, we do! We offer an exclusive ‘Key Worker’discount discounttotothose those who who are are employed employed by by public publicGovernment Governmentbodies bodiessuch suchasasthe theNHS, NHS, Police Police Force, Force, Education Education and andMinistry Ministryof ofDefence! Defence!More Moreinformation information can can be be found found on on our our website websiteat at bovishomes.co.uk/information-on/key-workers bovishomes.co.uk/information-on/key-workers What do you love most about the South West? What do you love most about the South West? We love everything about the South West! With city, coast and We love everything about the South West! With city, coast and country on our doorstep, this beautiful part of the world provides us country on our doorstep, this beautiful part of the world provides us with the perfect backdrop to build homes that people can really fall with the perfect backdrop to build homes that people can really fall in love with. in love with. dough hook attached, add the rest of the ingredients and mix for 10 minutes on slow speed. Cover the bowl and leave in a warm place until doubled in size. Place back on the machine and knock back by mixing for 30 seconds. Brush your largest baking tray (30x40 cm) with oil. Tip dough onto a well-floured surface and, using your fingertips, press out into a large rectangle. Fold over the back of your hand/arm to lift and lay into baking tray, then press out to fill tin. Cover and leave again for 45 minutes. Heat oven to 240°C. Drain potatoes and pat dry with clean tea towel. Chop anchovies and garlic and add to olive oil. Dab about ⅓ of this mixture across the foccacia dough then scatter with half of the potatoes. Season well with plenty of black pepper and salt. Add another ⅓ of the anchovy/garlic mix and then the remaining potatoes. Finish with the rosemary leaves, salt and pepper and the remaining anchovy/garlic mix. Put into the oven and bake for 15 minutes. Check after 15 minutes and, if the top is browning too quickly, turn the oven down to 200oC (you want the potatoes to be a bit blistered) and cook for another 15 minutes. Remove from oven and allow to rest for 10 minutes before eating! Springtime in Bridport Spring is the ideal time to think about new beginnings. Whether thatâ&#x20AC;&#x2122;s selling or letting your home, Symonds & Sampson are perfectly placed in Bridport to help manage your move. Drop in and see us or call 01308 422092. Why choose us? We’re family owned and run, offering friendly, independent advice and the very latest in cutting-edge hearing technology. Offering a bespoke and comprehensive service to all sized blocks and properties by an experienced, professional and friendly team. Contact us to see how we can help you. Contemporary Interiors in Wood 5 rooms fullyour of unique wood work Find perfect new bed with us this April. from over 200 craftsmen working in the UK. With a reputation built on innovative design, high quality workmanship and reliability, we are happy to visit you to discuss your ideas and how we can help you achieve your goals. harsher making it more challenging to create a sense of space and light. Don’t fight nature but rather embrace the darkness and go with a more dramatic, intimate interior. You can achieve this using strong colours and motifs such as deep reds and purples in the wallpapers. If you would prefer to use lighter colours, avoid green- or grey-based colours and opt instead for warm yellows and creams which will help bounce light around the space. Her Majesty first moved here with her sister, Margaret, during World War II for safety, and it’s home to Queen Elizabeth as long as she is ruling monarch. She spends most of her private weekends here and it’s also used regularly for ceremonial and State occasions. The 5,000-acre Windsor Great Park consists of sweeping historic parkland, award-winning gardens, ancient woodland and forest trails and the Queen no doubt has her own private outdoor area near her state apartment. Handmade, Bespoke, Designer, Vintage & Bridal Headwear & Accessories for Everyday & Special Occasions Gorgeous Felts, Straws, Silks, Cashmere, Velvet... Hats, Shawls, & Fair Trade Baskets.... Studio 48, Tar Works Cut, St Michael’s, Art & Vintage Quarter, Bridport, DT6 3RR T: 07905 999437 • E: hats@fionaneylan.co.uk @FionaNeylanHats • www.fionaneylan.co.uk Open Wed, Fri & Sat (and most Tuesdays) or by appointment. The old Sussex tortoise, that I have mentioned to you so often, is become my property. I dug it out of its winter dormitory in March last, when it was enough awakened to express its resentments by hissing; and, packing it in a box with earth, carried it eighty miles in post-chaises. The rattle and hurry of the journey so perfectly roused it that, when I turned it out on a border, it walked twice down to the bottom of my garden; however, in the evening, the weather being cold, it buried itself in the loose mould, and continues still concealed.